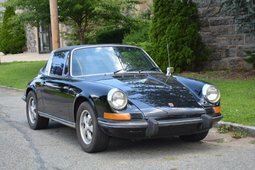 Beautiful 1971 Porsche 911 E in desirable color combination. 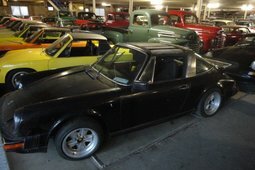 This is the E-model with the more powerful 3-liter engine from a 1980 Porsche 911 SC paired to the factory 5-speed manual. The car has 30397 kilometers on the odometer. The car has Danish title and registration and the upgrades are documented and approved by the authorities. The car is in great cosmetic and mechanical condition and can be enjoyed as is for many years to come. 1969 brought the first substantive changes to the Porsche 911 lineup, which now consisted of three models: the 911T, 911E and 911S. All of these were available in coupe and Targa body styles. The T was carbureted until 1972, while the E and S were mechanically fuel injected. For 1969, Porsche stretched the wheelbase and flared the wheel arches, allowing wider tires to be fitted. Unlike most performance cars of the era, horsepower kept climbing through the use of fuel injection and a series of 200 cc displacement increases culminating in the 1972 2.4-liter cars. The T was the base model with the lowest horsepower. It was tractable and quite adequate for street use. The E had a bit more horsepower and more luxury features.